And that’s it! 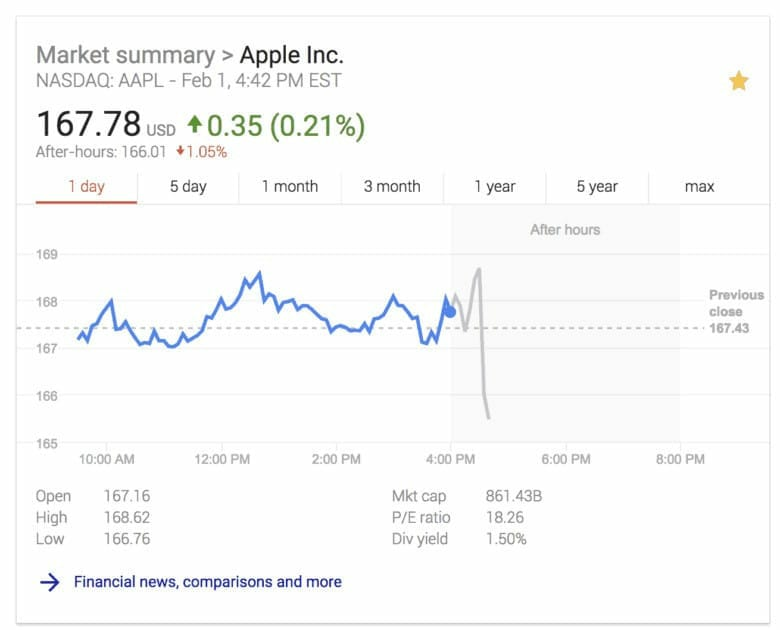 AAPL shares were down initially but they’re trading up 3.5% right now. Investors must be excited about getting some of that sweet cash back from Apple. On the China question: iPhone, Mac and iPad market share all grew in the country, and Apple Watch remains dominant. “Everywhere I look, I feel really good about how we’re doing in China,” Cook said. Despite having access to over $280 billion in cash, Luca Maestri says Apple’s thought process on mergers and acquisitions hasn’t changed. The company is looking for ways to speed up product roadmaps and considers companies of all sizes. It sounds like Apple’s not going to go out and buy Netflix AND Tesla just because it can and everyone wants it to. Tim Cook doesn’t want to peg HomePod as an amazing speaker over a smart speaker. He said some people will use it as an incredible audio device that comes in a small form factor, while others will be drawn to it to use Siri to control their home, make calls and other things. It’s way too early into the iPhone X’s product cycle to be able to tell how well it’s doing with Android switchers, says Tim. He’ll maybe have that data next quarter. “There are many many many many more” unique users now than there were last year says Tim Cook. *SHOCKER* Apple isn’t releasing an actual user number though, it only releases active devices because it has no way to tell how many Apple devices you own and use. Apple is still trying to absorb what Trump’s tax plan means for the company going forward. “It may be a bit bumpy in the short term,” Luca admits, as they wrestle with the complexity of the revised tax code. An investor asked whether the program has hurt upgrades and whether investors should worry about it. Cook basically responded that investors can be worried about whatever they want but Apple didn’t consider it. Asked about Apple’s future ambitions with AR, Tim Cook kept Apple’s cards close to his chest, as we’d expect. A “difficult memory-pricing environment” should ease later this year, Lucas says. Slowdown? What slowdown? Lucas says that overall, Apple will grow between $17 billion to $19 billion in the first two quarters of 2018 versus last year. The numbers are just mind-boggling (as per usual with Apple). “We believe iPhone revenue will grow double digits during the quarter,” says Luca Maestri. The sell-through is also expected to accelerate during the quarter as well. Luca also says that the average selling price for devices will decline sequentially the next two quarters more than has happened in the last few years. This is due to inventory flow issues from the November release of the iPhone X. The iPhone X is still the most popular iPhone in demand, even into January, according to Tim Cook. Customer satisfaction ratings are also really high for the device thanks to the new features like Face Id and the edge-to-edge display. Here come the analyst questions! Now we’re switching to the Q&A session. First up was a question on how much money will be returned to investors and ongoing cashflow though processes. Luca reiterated that the U.S. tax reform is beneficial to Apple because it gives the company more flexibility rather than having to raise debt. Luca says Apple will go over its cash allocation plans after the March quarter. Apple will pay the IRS $38 billion. Apple now has $285B of cash, cash equivalents, and marketable securities. 94% of the cash is outside of the United States. That will change soon. Seemed like half of them were in the San Francisco store! 538 million people visited Apple’s stores during the holiday quarter. Apple’s services are killing it. The App Store, Apple Music, iCloud and Apple Pay set all-new records for quarterly revenues. TL;DR Everything is awesome! It’s basically one record-setting number after another. “Missing expectations” with this kind of amazing growth is something else that only Apple can do. Luca is on the mic spilling numbers all over the place… He’s speaking so fast it’s hard to pin down a few, but everything’s going great overall. Apple Watch sales were up more than 50%. Exact sales figures weren’t released, but based on analysts’ figures that could mean sales were around 9-10 million for the quarter. Apple Pay milestone: It’s “now accepted at more than half of all retail locations,” Cook says. (We knew this.) The recently launched Apple Pay Cash is off to a great store, he adds, with millions using it to send money to friends and family. iPad revenue grew for the third straight quarter and gained share in almost every market Apple tracks. That’s great news after the company saw sales dip for two years. iPhone sales were down YoY, but if Apple had the extra week in 2017 that it had in 2016, sales would have been around 83 million. So sales were actually pretty good. Now that the tax law has changed, Apple plans to reduce its net cash balance (total cash to amount of debt) to “approximately zero”, according to Financial Times. That could mean Apple’s about to pay out a ton of cash to investors, or might buy a few big companies. “Apple’s biggest quarter ever” sure sounds reassuring, despite the slightly disappointing iPhone sales. Cook sounds calm. And optimistic! That was a pretty sharp U-turn! The after-hours trading looks literally like a cliff. APPL has been down a lot in recent weeks, but man that’s a pretty steep dive. Of course, those graphs always look scarier than they are. Apple’s expectations for next quarter are a huge area of concern for investors. The company’s forecast shows that sales will be lower than expected, leading to worries that growth may have permanently plateaued. The numbers are in and they’re not bad but they’re not as amazing as Wall Street was hoping for. Revenue was at a record $88.3 billion with 77.3 million iPhones sold. Tim Cook says the iPhone X has beat Apple’s expectations, but investors were hoping the company would sell around 80 million units. Get all the numbers right here: Apple’s record-breaking Q1 earnings fall short of expectations. So, is iPhone X a total, Cupertino-crushing failure or a happy holiday hitmaker? We’re about to get some idea of exactly how well Apple’s so-new-they-had-to-totally-tweak-iOS-to-handle-it iPhone is selling. Any chance Tim will break down the iPhone “product mix”? Doubtful. But we should come away with some serious insights. 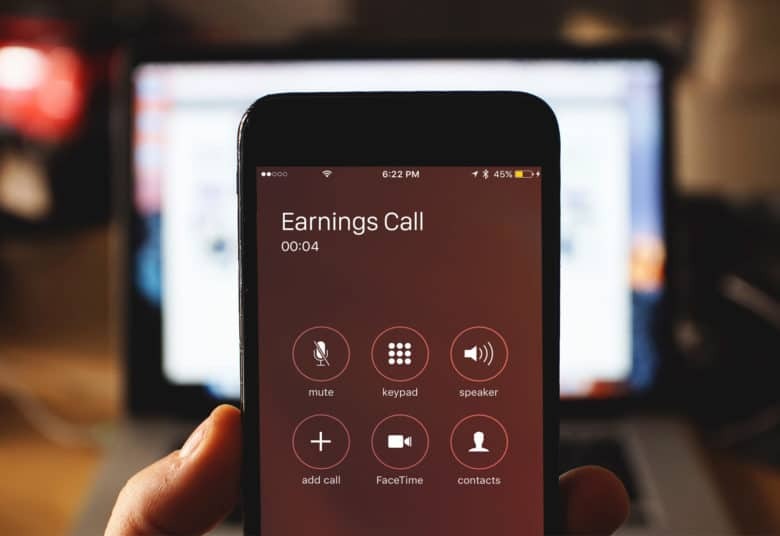 Until then, here’s a cheat sheet to get ready: What to expect from Apple’s first earnings call of 2018.